Q : What cable to buy ? => be carefull about gnd link it don�t match with WCH obd adapter, you need to link 4 & 5 together! Be sure your OBD interface is working fine before plug it to the bike. Q: Is my bike compatible? To ensure your cable are working, always run testcable from JPDiag with your both cable connected to computer and battery , but not connected to diagnostic plug. Q: I didn�t pay attention to croco , I plug it the wrong way , now my bike fan are still on , what to do ? A: Replace your ecu , or make a link between battery gnd and middle pin of diagnose outlet on the bike. Q: I get nothing displayed on computer when i click on connect. Be sure you are connected to the right outlet on bike. Check� in device manager what is the com port number used by your cable. Report this number in the field close to the connect button. Q: Button is missing for reset maintenance counter, resetting TPS or adjusting CO.
All ecu data collected will be available to all , to find what ecu / software is used on what bike ..
A: When engine is running , there is a lot of noise on wires. You need to add filters on USB line to avoid PC to hang up. I found many of the questions I had along the way answered here but some of it was confusing so I thought I'd put together another users guide to help out a bit. To begin with I'd like to thank jpl for his fantastic work and support and may I suggest if you find JPDiag useful and you're in a position to, that you show your appreciation by way of a donation for providing this excellent program for FREE!!!. Please do the right thing as it seems someone has already ripped it off to some extent and is selling it on ebay (Poor Form!!). Also a thank you to the following members: chrisw, iang27 and wayne111 and tonered from ducati.ms as I have utilised extracts and or advice from their various posts to pull this together. JPDiag will allow users to do a number of things in it's basic form however it is possible to add further functionality for a small fee just contact jpl for further information. jpl has also created courroies, which is a belt tensioning program. At some point these links will expire so the sellers name is "verymech" (http://myworld.ebay.com.au/verymech/?_trksid=p4340.l2559). I sent a note with payment suggesting he send both cable together, which he did, and as stated on his auctions he doesn't charge for post. I can recommend this seller. The VAG cable comes with its own driver - ignore it and download this driver. !!!! IMPORTANT !!!! --> INSTALL THE DRIVER BEFORE CONNECTING YOUR CABLES !!! Once you've downloaded JPD you'll need to unzip it to whatever folder you want (I didn't need any special program, Vista managed it). From what I recall there was a few steps and being in French I didn't understand everything it was proposing however I believe the 1st screen ask you to close all running apps, the 2nd screen asks you where you want to install JPD. There's also is a donation request, a note here, once JPDiag is opened you'll also find there's a button facility to initiate a donation, it's permanently in the program so you can do it at any time. I think I went in circles a bit but generally I stayed away from the quitter or something similarly named and the Oui is of course "yes" so click it. As you launch JPDiag� you will be presented with a screen displaying 3 picture options of your cable setup. Choose which one corresponds with yours when the time comes. There's discussion of this forum due to concerns that some Alpha cables may be sleeved incorrectly i.e. that the positive lead is sleeved black and the negative red. I can confirm the lead I purchased is operating safely. 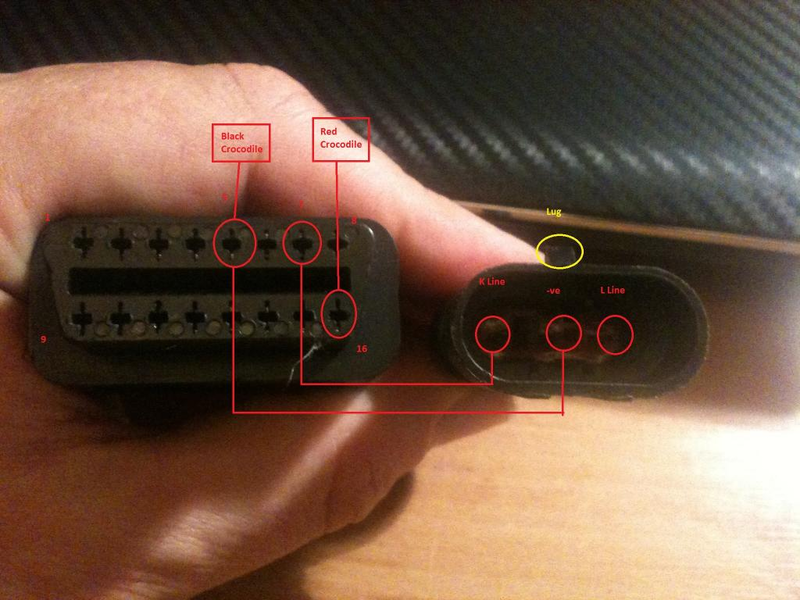 You'll see at the linked page below a picture identifying the operating pins on the OBD cable. The pin you need to check is #16, it is positive power so set your mm to ohms and connect one probe to pin 16 and the other to the red alligator clip. Now since the pinout image on that page is of the OBD cable you need to translate that to the female recepticle of your Fiat cable. I simply inserted a largish sewing needle into the corresponding female pin hole and connected the mm probe to it to check continuity. Check your negative while you're there too if you like, it's pin #5. Pin #7 is the K line which you needn't concern yourself with. That's your polarity check sorted. DO THIS BEFORE YOU CONNECT UP TO ANYTHING !!! At this point you should have installed the correct driver and JPDiag. 1. 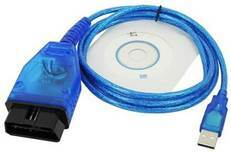 Join the OBD and Fiat cables together and plug them into the usb of your computer. 2. Check in Device Manager under Ports which COM port the cables are using. I've seen here where people suggest using some number 10 or below but I'm using Vista and it came up as 12 and seems to be fine. You will need to know the port number in case it needs correcting in DD. DO THIS BEFORE CONNECTING TO YOUR ECU. If you select the device listed under ports and right click, go to properties and in the drivers tab you can check to make sure it's operating with the right driver which should be FTDI. 3. Connect red alligator to pos battery and black to either neg battery or a good earth on your bike. 4. At this stage a little blue LED came on in the OBD cable. I don't know if all manufacturers had this facility. 5. Launch DD and select your cables. 6. Once the program interface opens you'll see a connect button alongside a field into which you'll need to enter what COM port you're using. 8. At this stage you can do another test on your cables. Set your mm to 20v and do as. Connect the +ve and -ve fly leads to a 12v power supply e.g. your bike battery but do not connect the diagnostic plug. Set your mutimeter to 20v and connect the +ve lead on the meter to the single outer pin in the Fiat Adaptor. It should look like this - | - -. Connect the -ve lead from the meter to the middle pin or the -ve terminal on the power supply. Your meter will read in excess of 12v straight away. If you have the correct com port you will be able to click on the KLine 0v and the voltage on your meter will drop to 0.3v. Click on the KLine 12v and the meter will read over 12v. 9. Now if everything to this point is in order go ahead and connect your Alfa lead up to your ECU. 10. Click the connect button which is near the port # field and you will see on the screen "connecting", I waited a little while then turned the ignition key on and like magic on the left hand side in JPD� you'll see the basic ECU data. Copy it and post it in the request License form and you'll get a message back from jpl which will include licence file. This cle.lic file then needs to be copied into the JPDiag directory . This is as far as I have come in my journey, it's the process I used successfully but do further reading or speak to your mechanic if you're not sure what you're doing. I hope this helps. Don't plug the lead in until you have run the driver exe file. I though I would make a 'basic' guide in english for those not sure what they need and how to use it. If any 'expert' users want to add to this then please do so with tips, advice etc. Other cables are available but these ones work and the prices are good, took about 3/4 days to arrive. The only other thing you need is the com driver which is different for the various operating systems but is available on the website, somewhere ! connect cable to battery ,but not to bike loom. 4 Open JPDiag� and change the port number to whatever port you are using. 5 Click on connect and turn on ignition - You should have your ecu information displayed. 7 When you get your license by email, download the file and copy into the JPDiag directory. 8 When you next connect you will notice that the 'Service' and 'TPS' buttons are active, you can now reset them. 9 I recommend that you make a 'Dump' file of your standard map and save it to allow you to reload it if ever needed. MAKE SURE YOU KEEP CONNECTED AND DO NOT DISCONNECT UNTIL YOU ARE INSTRUCTED TO TURN OFF IGNITION. You may need to reset your dash to whatever region you are located in, this can be done by holding down the left button while turning on the ignition, go to the relevant section choose your country and hold the switch down to save it, turn off ignition. I 'think' that is about it for the basics, good luck ! 3: Remove the CO plugs from the header and screw the adapter in. 4: Plug in the synchrontester at the intake manifolds. the butterflies. At 4 valves with the connecting rod between the Butterflies. 6: Open the idle screws that the bike idle at 1100 rpm fully synchronized. 7: Warm the engine up to 40�. Up from that point Co adjustment works in JPDiag. 9: The same at vertical cylinder. 11: Then you can change the value in JPDiag that there are 4,5% on both cylinder. 12: That it was,you can remove Gas tester and Synchron tester.